The TerraTrike Gran Tourismo is a rugged steel sport touring trike for no-nonsense practical daily use and for affordable adventure. Having been TerraTrike dealers since 1997, we’ve seen the evolution of design in TT’s products. The Gran Tourismo represents the closing of a circle, beginning with the concept of the original TerraTrike Tour, the original “TerraTrike” back when that term referred to a model, not the whole company. 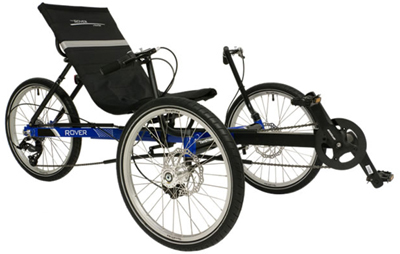 It goes through 2011 with the inception of the Rover, which reinvented the company and redefined the recumbent industry. Now in 2018 the Gran Turismo has arrived to pick up what the original “TerraTrike 1.0” was all about. This development is timely. TerraTrike cancelled production of the Tour a couple of years ago, which was a relief. The Tour was definitive for its time, but after 20 years of production it had become outclassed. The concept of a do-it-all sport touring trike, not over-geared, but set up for loads and climbing, with a low seat for stability and a basic, good quality derailer transmission was still relevant and wasn’t well-addressed. 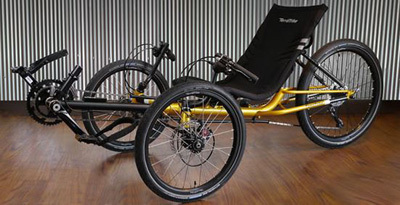 Lately TT has distinguished itself with trikes like the Rambler, building a high-sitting casual trike on the model of the Rover. And they introduced their new design elements in the sport-touring Sportster. But the Gran Tourismo pegs it with a characteristic certainty. As the name suggests, this trike emphasizes the touring, not the sports. It is a level-headed little trike aimed at practical use, at a practical price. Most significant is the use of TerraTrike’s direct steering design. This is standard for TT’s nowadays, and it is a great improvement over the indirect steering on the original Tour. 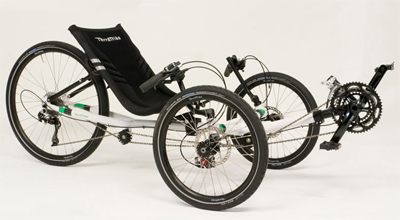 As people who set up these trikes we’re saying “right on.” A new advancement in TerraTrike’s seat appears on this model, with an extended seat base which makes a more upright seat position more workable. Unlike the Rambler and its derivatives, the Gran Tourismo uses a bent frame to drop the rider’s center of mass a bit to improve handling. But the seat is still easily accessible, and the Y-frame design pioneered on the new Ramblers helps get you more over the seat before sitting down. The rear of the frame is more triangulated for greater stiffness in cornering. The 24″ rear wheel addresses a problem many had with the old Tour. 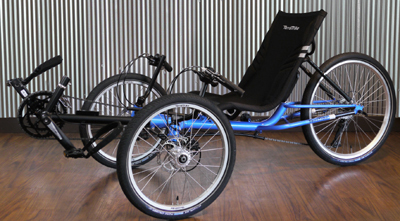 The trike was configured to be a good speed trike, but the 20″ rear wheel limited its top speed. There was a kludge to retrofit a 26″ rear wheel, but using it affected both the steering geometry and shifting. Moving to a 24″ ups the gearing but keeps the trike compact and holds onto some lower gearing better than a 26″ wheel does. The more compact rear wheel also helps keep the rear of the trike stiff in cornering. The Gran Tourismo embraces the 2×10 gear standard found on modern conventional bikes, making service and upgrades easier, even if you are going to a less enlightened bike shop than Easy Street. As usual, you see mostly mountain bike parts with the exception of the crankset and front derailer, which are geared higher with road bike parts. Schwalbe Marathon tires provide a durable, do-everything tread paired with a wide pressure range to fit a variety of riding styles. There are no cutting edge breakthroughs with this trike like you see coming out of ICE and AZUB. This is a case of striking the right balance in price and performance. This is a sensible analysis of the market by the people whose trikes make up most of the market. The x16 model comes with an affordable 2×8 speed transmission for $1999. The x20, which we stock, uses a wider range 2×10 transmission and a respectable set of parts. Our price: $2499 for the Gran Tourismo x20, $2099 for the Gran Tourismo x16. But it doesn’t stop there. We’ve included direct steering along with TerraTrike’s own “steering stack” that provides a responsive yet predictable steering experience. The GT also comes standard with a 24” rear wheel for higher top-end speeds, all while rolling more smoothly over bumps and retaining momentum. To top it off, the aluminum seat frame, handlebars and tie rod reduce weight without sacrificing strength. The Gran Tourismo features an extended seat frame with an upgraded seat mesh. This is by far the most comfortable seat we’ve ever produced and will result in longer, more comfortable rides; featuring a breathable mesh and extra padding in “all the right places.” The extra seat frame length is contoured to give additional support and comfort. There is even a zippered pocket on the rear just large enough for a wallet, keys or cell phone. 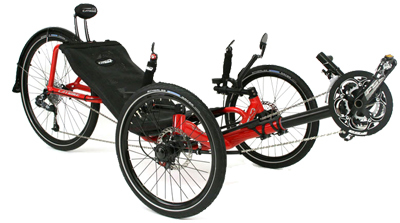 The front wheels use a rapid axle for easy removal for transportation; the seat, a single seat bolt for quick and easy seat removal; and a single hex key for both. Pair all of that with the stunningly beautiful paint colors and you’ll be turning heads all day. The “wet” paint colors add more depth of color and are durable. Sparkle Gold and Sky Blue are the signature colors with limited edition colors being offered periodically. This is a limited range of seat adjustment, with most leg length adjustment done at the boom. 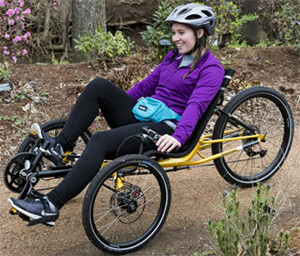 This makes this trike less easily adjustable “on the fly” than trikes like the Rambler, but it keeps the seat in an easily accessible place and the seat attachment system gives a much more secure attachment. As usual, the TerraTrike seat gives a wide range of recline adjustment, going quite upright. On the heavy side for sport touring trikes, but in keeping with the high seat, high weight capacity, and steel frame. That is pretty pretty good, and in keeping with direct steering models.